In some ways a sequel to Besson's The Professional, but with a different back story. 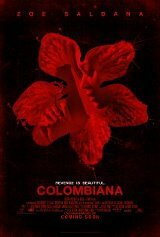 A young girl sees her family gunned down by a Colombian drug lord. She moves to the USA where her uncle raises her and teaches her how to be a killer, as she is intent on revenging her family. The drug lord has meanwhile been placed in protective custody by the FBI, so she goes on a killing spree with the aim of getting to him. However complications arise and she is forced to choose between exacting revenge, and protecting the new family that she is now part of.